With the rapid pace of change in modern health care, the importance of formal training in operational aspects has never been more critical. Today’s health care organizations require high performing teams, working together seamlessly to deliver innovative clinical care in complex environments. As patients and families increasingly focus on value, efficiency and supportive care services, leaders must implement and refine patient-centered programs. 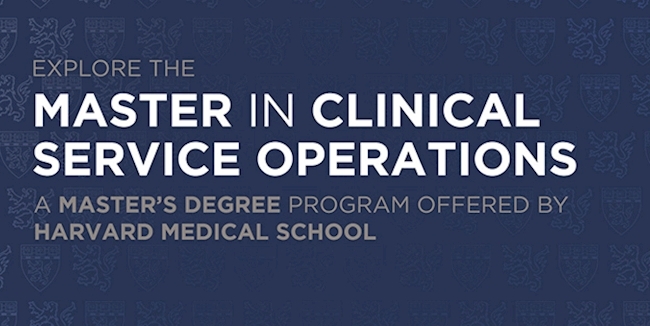 The Harvard Medical School Master’s Degree in Clinical Service Operations (MCSO) provides physicians, clinicians, nurses, allied health professionals and administrators with the operations management training they need to lead teams, optimize efficiency and improve the patient experience. Designed with working professionals in mind, the MCSO is an intensive, 36-credit residential program that can be completed in just nine months. In addition to traditional didactic learning, the program incorporates innovative case studies, simulations and a comprehensive capstone experience in clinical operations at a Harvard Medical School-affiliated hospital. The MCSO program provides learners with clinical operations skill sets and knowledge that are essential to lead health care organizations in the United States and internationally. We invite you to join our academic community at Harvard Medical School and experience learning in a program that will excite, challenge and inspire as you embark on one of the most important journeys of your clinical leadership career.